(Note: the 7.4 lb loss wasn’t in 20 days. 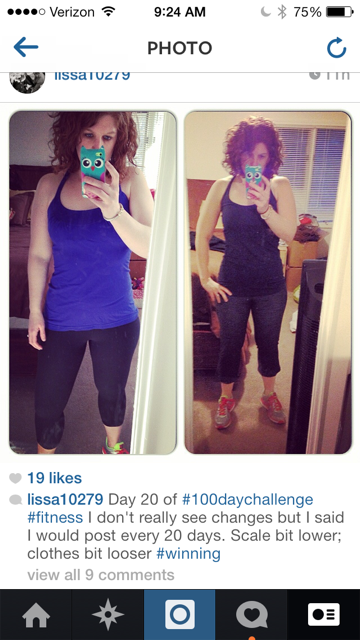 I started my mission a couple weeks before the 100 Day Challenge began … but this has helped my motivation remain strong. For me, slow and steady wins the race). So here’s the comparison shot. To be honest I don’t see much of a difference (Day 1 is a closer shot so it’s hard to see any real change) but I know I feel leaner and stronger and that counts for something, right? [Left is Day 1; right is last night, Day 20]. 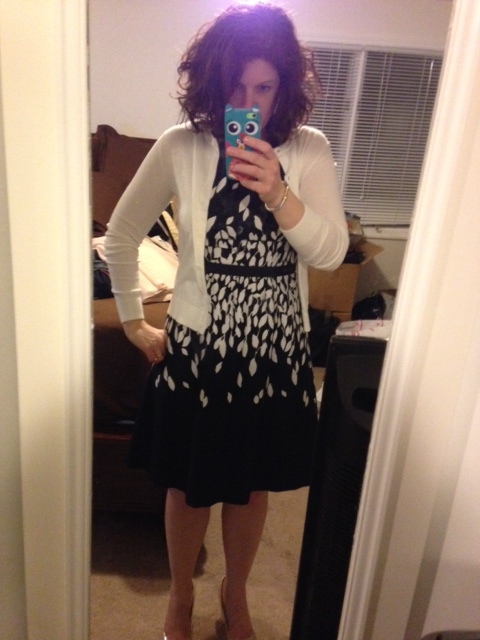 And last night, this dress — a size 6 from the Loft from like four years ago — zipped up. I almost jumped for joy for two reasons: 1) I am NOT a size 6 and 2) it’s a structured and fittded dress, not a flowy one … so the fact that it zipped is an even bigger miracle and, once I lose these remaining 7-8 vanity pounds, I bet it will fit even better!! Dress — size 6 — fits! Ultimately what it comes down to is I have to make time to work out. It’s not easy for most of us; there are only 24 hours in a day. And lord knows I’m not the only working mom with two kids, a husband and a household to run; there are millions of us in this boat. But I can only take responsibility for me, and that means I have to carve out a little time most days of the week. It’s really the only way; fitness makes me happy. It’s a hobby and a passion. And working out regularly makes me a better mom and wife. With this rediscovered dedication to fitness (which went on hiatus the last month of my pregnancy and lasted the first five months of Ben’s life), I’ve had to make some concessions and haven’t been able to just hit the gym whenever. *From 6-8 PM is my sacred family time (“SFT”). As a rule, I don’t make plans during this time (unless it’s date night or a special GNO). And I don’t go to Zumba anymore during the week, as the classes clash with SFT. *I’m a morning person and miss being able to go in the morning but it’s just been tough with nursing and Ben. So til I can get back into an AM routine, I will go at night. *Typically I go to Zumba at noon on Sundays but now that it’s getting nicer out and we tend to have yard-work and stuff, I opted to instead go at 9 PM when Luis had a weekly conference call last night. I just get it done when I can. #wycwyc. I make these concessions because I have to, but also because I want to. I don’t want to miss on family time, period. Lookin’ good! Stay on the grind, momma. Congrats – you look great! Also, your clothes are super cute. I need to go clothes shopping!